Asbestos is a mineral fiber that occurs in rock and soil1. It was widely used in many building materials including: insulation, ceiling tiles, flooring, and roofing materials, because the fibers are strong and fireproof. 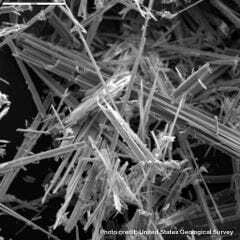 Asbestos is hazardous if the fibers become airborne and are inhaled into the lungs. Inhalation of asbestos fibers can potentially cause lung cancer and other respiratory illnesses. Materials that contain asbestos generally do not release asbestos fibers into the air unless they are disturbed. Any asbestos-containing material that can easily be crumbled by hand is potentially hazardous. Likewise, any demolition or renovation activity that removes or damages asbestos-containing material can be hazardous if safety precautions are not taken to prevent the release of asbestos fibers. The U.S. Environmental Protection Agency (EPA) has determined that asbestos can cause cancer. In order to protect citizens from the health hazards presented by airborne asbestos fibers, all building demolitions and many renovation projects require a permit from the Air Pollution Control Bureau. Demolition Project: (with the exception of one private residence containing less than five (5) dwelling units where the property has not been used for commercial, business or institutional purposes) regardless of whether the building contains asbestos or not. Demolition is any wrecking or removal of any load-supporting structural member of a facility. An Asbestos Survey* and a permit are required. Renovation Project is the altering a facility or one or more facility components in any way, including stripping or removal of regulated asbestos-containing materials (RACM) from a facility component. An Asbestos Survey* and a permit may be required. Asbestos Removal Only Project is the removal of regulated asbestos-containing material or facility components that contain or are covered with regulated asbestos-containing material from any facility. A permit may be required. *An Asbestos Survey includes an inspection, sample, and laboratory testing of suspected asbestos-containing materials. This must be conducted by an individual or company certified by the State of Tennessee. Permit fees are required to be paid before the permit will be issued. The fee schedule can be found on our Fee Schedule page under Asbestos. Check the website before each project to ensure that you are aware of any changes in asbestos regulations. For additional information or questions, contact our Asbestos Coordinator, John Schultz at 423.643.5988. **The Chattanooga-Hamilton County Air Pollution Control Bureau does not certify, endorse, or make any representations regarding the services offered by these companies. This list is merely provided for your convenience.